I compiled this cookbook a few years ago with the help of our babysitter (back when we needed a sitter!) who was always like a daughter to us, Jordan McGarrigle. UPDATE: she is in COLLEGE now! Can you even believe this stuff? 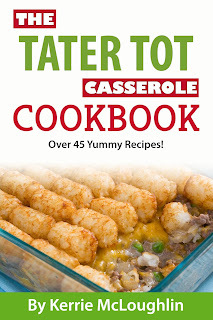 Anyway, the book includes 34 tater tot casserole recipes (including a gluten-free and a dairy-free and even a vegetarian) plus some dessert recipes! You will love it and it will make your meals easier than ever with a lot of variety to boot! Here is the latest edition to the fully updated and improved cookbook: Fully Loaded Tater Tot Casserole ... and it's a little bit different but I think you'll love it! Perfect potluck take-along or comfort food after a long day and customizable! You don't have to have a Kindle to download the book. You just need an Amazon account and you can load it to your cloud reader and read it on your laptop or iPad or PC or whatever floats your boat. If you have Kindle Unlimited I offer it FREE! Here's the download link. If you love it, please leave me a review! And please share the love by tweeting, Facebook sharing, pinning, etc.! If you are just finding this post and it's not free anymore (I make it free every 3 months or so), please purchase here and THANK YOU for supporting me! Thank you for supporting my love of writing, kids and fun!